The Gasthof has stood broad and sedate on the Wallgauer village square since ancient times, surrounded by the picturesque landscape of the upper Isar Valley. The Gasthof & Hotel “Zur Post” in Wallgau is one of the most beautiful and popular traditional hotels in Bavaria, situated nearby the wonderful Walchensee and Karwendel, at the foot of the Alps, close to the Garmisch-Partenkirchen ski resort. This is where nature, tradition and Bavarian hospitality come together to indulge our guests and tourists. The Wallgauer institution is an integral part of village affairs. Wherever you go in Germany, those who know Wallgau in Garmisch will enthuse about the Post: regional cuisine, warmth and hospitality as well as atmospheric parties and weddings surrounded by the natural beauty of the upper Isar Valley, the Karwendel, Wetterstein and Soiern mountains. Bavarian, good home cooking – “sauguad”! 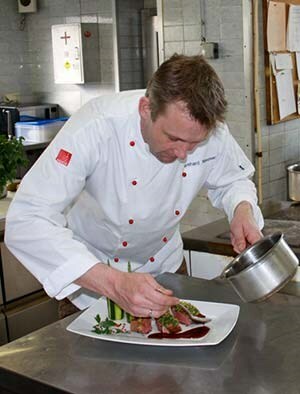 Our renowned kitchen with its regional specialties is one of the top names in the district of Garmisch-Partenkirchen. Led by owner and Head Chef Bernhard Neuner jun, our chefs cook themselves,... and you can taste it. The kitchen sparkles with regional specialties and will overwhelm the most discriminating of palates; the roasted whole veal shank, carved at the table, can be a culinary experience in itself, that's if your haven't already decided upon a freshly caught, Walchensee - Renke (depending on the season) fried in butter. One after the other is rarely possible as the juicy shank with two dumplings and a huge salad feeds almost an entire family. The stability of quality, price and service of this traditional Bavarian inn is not only impressive but almost a miracle in these present times. If we are to believe the legend, the Post hotel in Wallgau can look back on more than three and a half centuries of history. partner of Biker Betten and Eurobike! The appetite and the soul are not the only things indulged at the Post hotel Wallgau. The traditional Bavarian hotel in the Garmisch-Partenkirchen region is also a paradise for bikers and motorcyclists. The central location of Wallgau, in the Bavarian Alps, the Karwendel nature reserve, the Garmisch-Partenkirchen region and not far from the Walchensee, makes the Post hotel Wallgau the ideal starting point for tours and excursions by bike, mountain bike or motorcycle!! Which is why the Post hotel Wallgau is an official partner of Eurobike and Biker Betten and is one of the most biker friendly hotels in Germany!